The Great Patriotic War became for the Soviet people the most terrible and heartrending experience. And however many has passed years, everything will be remembered by their feat and glory of our heroes never will grow dim. The Victory Day forever became the most joyful holiday, the most expensive and personal event. And, in spite of the fact that years alienate us from it farther and farther, the value of this day will never change, memories of heroism and courage of our people will never be forgotten and will be transferred to the next generations. May 9 – A Victory Day in war over fascist Germany. This day the solemn program in celebration of a Victory Day in which traditional parade at the Palace Square is carried out on May 9 is prepared. In St. Petersburg establish a little concert platform on which there take place speeches of actors in honour of a great holiday. All congratulate veterans, give them flowers and heartily thank. Traditionally, the holiday comes to an end with a salute, under each volley people shout "Hurrah!" and sing military songs. 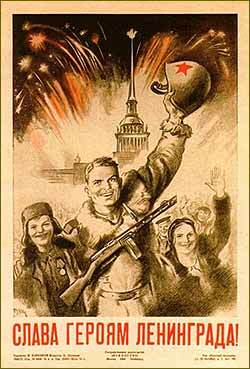 On May 9 – the most esteemed holiday, and a feat of the Soviet soldiers will never be forgotten by the country. City news archive for 05 May' 2016. City news archive for May' 2016. City news archive for 2016 year.